When some individuals leave an organization, they leave behind an indelible impression on the people with whom they have worked. Others retire from an agency and leave behind a collection of invaluable artifacts that invariably transform the place where they have worked. Remarkably, my friend Toni has done both throughout her illustrious career as the Director of the CIA Museum. Over the years I have had the pleasure and the honor to work with Toni on a number of memorable projects. Along the way she has shown me that art and artillery can share the same gallery space, there is a color darker than black, and history never gets old. The 2,000 museum tours she has conducted since 1999 have demonstrated that storytelling and silent service are not incongruous. She has inspired me, and everyone who knows her, with her knowledge, passion and humor. Quite simply, she has done more to preserve the culture and history of a workplace than anyone I know. Toni, I will think of you every day I drive into work and pass under the shadow of that dark, dark, dark, dark, dark blue-black supersonic aircraft that overlooks the parking lot, frozen in flight. Every time I walk down the corridor lined with historical paintings and portraits, I will hear your hushed voice explaining the significance of every brush stroke and every hidden detail, to yet another group of wide-eyed visitors. And no doubt I will continue spying traces of you amidst the impressive amount of “organized clutter” and artifacts that adorn your office, long after you have left to start your next adventure. 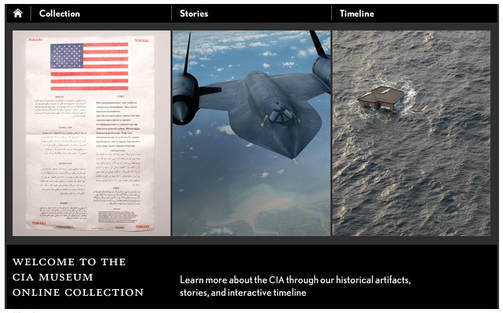 Click to visit the CIA Museum online. Through the serendipitous cat’s cradle of connections that comprises our lives, you are leaving your beloved museum in the hands of the most capable person I know to succeed you. I hope I have as many opportunities to support his creative vision to inspire, instruct and inform, as you and I have had. Thanks to Toni’s love for all things aviation, I finally have the opportunity to spotlight one of my all-time favorite pop songs from the Paisley Underground scene that was popular in Los Angeles in the 80s. The Happy Medium Song of the Day is “Jet Fighter,” by The Three O’Clock, from their brilliant 1983 album Sixteen Tambourines.